Cora is age 11 living with the Palmer’s in May 1895. “In the fall, we would make sorghum molasses, as they always raised a patch of cane. Then they made apple butter with the sorghum — also pumpkin butter, using the sorghum instead of sugar. They were very thrifty and tried to produce as much of their food as they could, sell the surplus, and buy what they could not produce — such as sugar. coffee, salt, soda, baking powder, rice, etc. For their cereal, they ground wheat in the coffee mill, which is very good cooked like rolled oats, only it takes longer to cook. In the spring, they made maple syrup as they had a ‘sugar orchard’ — they were called then — of about 100 trees. They sold the syrup at $1.00 per gallon, and they also made maple sugar and sold it for 50 cents per pound. They kept about 20 gallons of the syrup to use themselves and everyone really ‘sopped’ up the biscuits in the ‘lasses,’ as they called it. I would bake about 40 biscuits for breakfast, as we only had the syrup at that meal. For his large family, your grandfather (William Perry Palmer) would buy flour by the barrel, also sugar. They bought green coffee by the 50 pound bag. Your grandmother (Mary Palmer) would roast it in the ove — in big pans — it would have to be stirred often during the roasting time. She would then pour the white of an egg over the hot browned coffee berries, stirring ’til it was coated all over with the egg white. Then it was cooled and stored in jars ready for use — they would grind just enough for each meal. Picture of William Perry and Mary Palmer family was taken about two years before Cora McCauley arrived. Charley is at the back on the right; one son has married and is not pictured. Woman beside Charley is unknown. “I never had to work hard. Whenever Saturday afternoons came, I was to bake about four pies and to cook a big pan of rice for the Sunday dinner. We always had lots of company for meals, and (they would) spend the nights too. They had so many relatives who came for Sunday dinner or came Saturday night. Sometimes entire families came. But your grandmother always fixed the other meals, except the cornbread. I would make it in a little wooden bowl with 2 eggs, 3 cups of buttermilk, and enough cornmeal to make a rather thin batter. Then poured it in a large black iron pan, greased and piping hot. When done, cut out in squares. We didn’t have white bread for dinner. “We visited a lot and went to church and Sunday School. I had a horse to ride to church. ‘Course I went in the spring wagon with the family when they went, but they didn’t attend Sunday School. “We lived about two and one-half miles from school, so we rode most of the time, especially when it was muddy. When it was nice weather, we walked and cut through the fields, as it was nearer that way. “We did not have a big house, but we would always find a place for everyone who came to stay. We had a spare bed in the “parlor,” one in the hall, a trundle bed in the living room which stowed away under your grandparents bed. Tony, Claude, and Shannon slept in the trundle bed — a little narrow sofa bed in the dining room and two big beds in the boy’s bedroom. My room was upstairs with the stairway up out of the living room, which was your grandparent’s bedroom. “Well,I did wonder about them some, naturally I would. They were good to me in every way. But the first morning was rather hard, for I was told to get up and fix breakfast for them (Cora was 11). “There was no coffee, ready-ground, sold at the grocery store in those days. So, she showed me where everything was and (how) to measure the coffee. After I had ground it in the coffee mill and measured the water also, when I had it about ready, she came into the kitchen and we carried it to the dining room. “There were seven boys at home then. Two were married and had homes of their own. I cannot remember if I burned the biscuits or how anything tasted, but for several days I was a homesick little girl as I had never been left with so many strangers before. So I had several “weepy” nights. But they were all good to me, and I soon fitted in. They always treated me as one of the family. “Here are the boys names: Edney, who was the oldest and married . . . Robert, who was also married. Charlie, (Cora spelled his name ‘Charley’ some times), who later became your father. He was 18. Then Rufus (14), Ezra (11), Billie (10), Claude (8), Tony (5), and Shannon (3). Excerpts from Cora’s Memoirs about her early years — text in italics is mine. George T. and Elizabeth Thurston. Cora’s mother died September 7, 1888. Cora also lost two younger sisters about that time — Amanda Trimble died on July 21 and Madia Amner on September 10. The cause of death was most likely an epidemic, but it’s not recorded in Cora’s papers. Cora still had her father who was 27 years old when he lost his wife and two of three daughters. Why did she consider herself an “orphan”? Read on . . .
“I was left in care of my Grandmother Margaret Jane McCauley . . . my father broke up his home, and I went to live with my grandmother in her home — which consisted of her daughter, Malinda Francis, and her son, Robert Walker McCauley and also my great aunt Malinda Jones (Margaret’s sister). My grandmother had lived through the Civil War and provided for her three children. She knew how to make the most of everything she had. 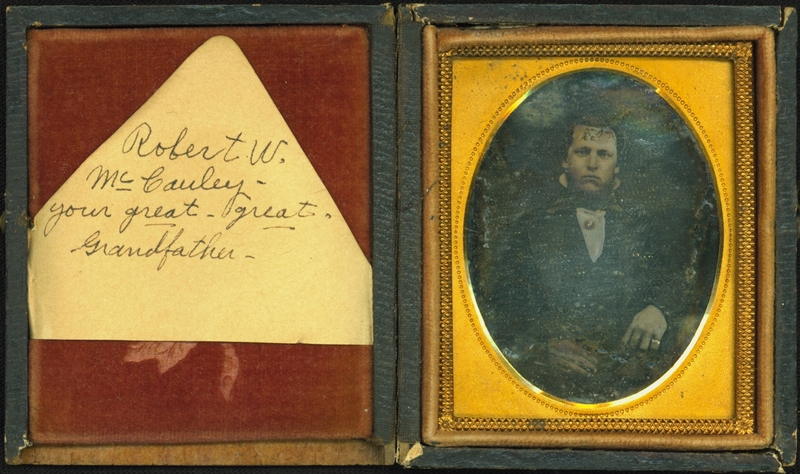 Her husband (Robert Walker McCauley, Cora’s grandfather) was wounded in the “Battle of Gettysburg,” taken prisoner, (July 1863)and died in the Federal prison at Point Lookout, Maryland (August 17, 1864). “My father married Salle Brooks, and my grandmother and I went to live with them (1891) When my father and stepmother started a family, I just didn’t fit in. So the last of May 1894 (age 10), I went to live with my Grandfather Thurston and his family near Midway, Missouri. My Grandmother McCauley went to live with her daughter who was married; and I missed her very much. Then, one day I was at school at Midway, and my father came and said he had found a home for me with a nice family — the Crosswhite’s — who lived near Hinton, Missouri (about November 1894). In May 1895, my father came over and told me he had a new home for me, as Mrs. Crosswhite couldn’t keep me any longer because she was in poor health, and I would be a responsibility to her.